USB3.0 Interface. Using advanced USB3.0 technology, this DVD-RW drive provides you high speed data transfer (much faster speed than the USB2.0 port) with strong fault tolerance. compatible with USB 2.0 and USB 1.1. With this DVD burner, you can install system by yourself to get rid of the trouble that turn to the professionals for help Compatible with Windows 2000,7,8,XP, Vista and all versions of MAC 10 OS systems. Detachable USB cable and the Eject design; Never worry about the disc stuck inside. It supports read CD,VCD,SVCD,CD-R,CD-RW,DVD-R/DVD-RW and burn CD-RW,CD+RW,DVD-RW,DVD+RW etc. 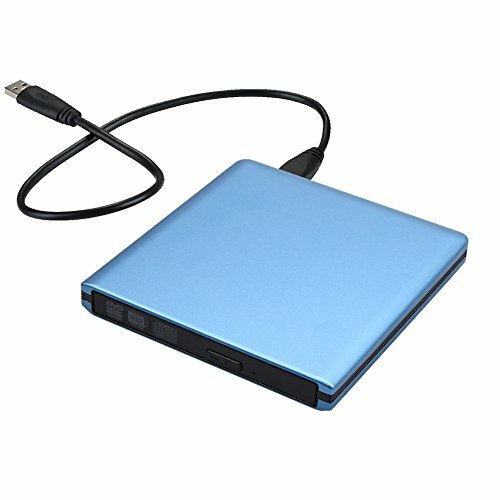 With this slim DVD burner, you can watch DVD movies, listen CD music, copy music, pictures, movies to a CD/DVD, install software, or create backup discs, etc. Easy to Use - Plug and play,powered by USB port. No external drive needed. Including Two USB Cables - USB3.0 is used for data transmission and power supply, USB2.0 is used for extra power supply, if your computer can not supply enough power with only one cable, please connect it with two USB cables.